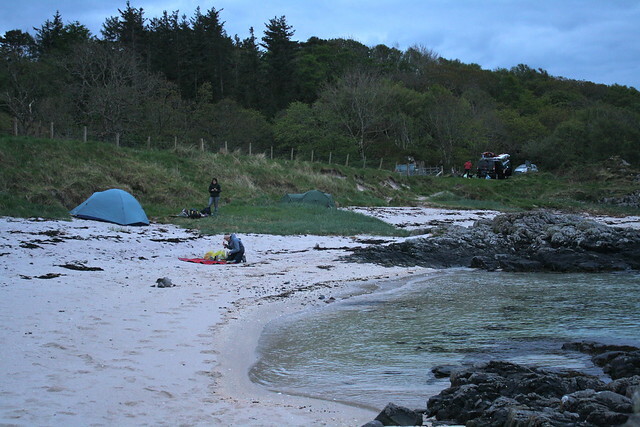 Home » roamscotland » ARISAIG. In my perusing of iPhoto I came across this beauty. Arisaig, or the Safe Place, is a village set on the shore of Loch nan Ceall on the west coast of the Scottish Highlands. Chilly clear blue waters and outlooking the Hebrides this was a welcomed landscape variation from the jagged and mountainous Cullins region on the Isle of Skye. We arrived to a ghost town with only a grocery store (the only one) open. We quickly gathered together dinner supplies and set off on foot to explore the village. The single road wraps around to the church on a hill overlooking the loch. With the single lane street vacant of traffic, and the town void of other tourists the entire walk you could hear the quiet lapping of waves against the sandy coast. Before we left on our trip Dustin’s Grandpa Pace had asked us to keep an eye out for any McDonald’s on headstones. We received fair warning that there were in fact two clans of McDonalds, one spelled Mac- and one spelled Mc-, the latter was ours and not to be confused with the first. Up until this point all the tomb stones we had found were of the Mac- clan. As eery as tomb searching sounds, we actually found the grave yards to be beautiful and solemn places…well until J picked up a book of Highland Ghost/Folk Stories. As luck would have it we happened across tomb stones of the Mc- clan ancestors of Grandma Pace’s family. After our short bout around the village we set off to find a spot to set up camp. The beauty of Scotland is camping on public lands is free of charge and can be done anywhere, within reason. We found a pull off already holding a Sprinter filled with a group of four 50+ year old women gathered around a campfire in wetsuits and enjoying dinner after a sea kayaking adventure. They welcomed us to share their beach camp and we set to work making setting up camp. The spot was my favorite of the entire trip, like it had been pulled straight out of an adventurist’s novel. A white sandy beach, surrounds by black rocky shore, with clear blue ocean waters reaching to the shore and stretching out past the loch and into the vast seas. We made camp, enjoyed warm drinks, a hot meal, soaked in the scenery, and as a symbol of one of our final nights in Scotland we set off paper lanterns we had found in the grocery store. Then came the lights, bright flashing red, blue, and white lights. Then the megaphone voices–still drowsed with sleep I can’t quite remember what was said. I perked up pretty quick catching the word “coast guard.” My first thought was my supposed “flagged passport” had caught up to me, so with the feeling of urgency I stuck my head out the tent door only to be blasted by a spotlight. Come to find out a patrolling guard out a sea had seen 4 lights float from the coast into the sky and go off evenly spaced apart. They had radioed to the village’s land unit to search the coast for any distressed ships. It took a minute then it clicked our paper lanterns, 4 lights we had set off had been the supposed distress call. With the misconception cleared, my name and number were taken down for record–another point to my growing Scotland “record“–the night fiascos ended and I was drifting back off in my safe place.